The story and biography of Frederick Barbarossa which contains interesting information, facts & the history about the life of this Medieval person of historical importance. Frederick I was one of the most famous of German emperors. He was a tall, stalwart man of majestic appearance. He had a long red beard and so the people called him Barbarossa, or Red-Beard. He came to the throne in 1152. At that time the province of Lombardy in northern Italy was a part of the German empire. In 1158 Milan , the chief city of Lombardy, revolted. Then over the Alps came an army of a hundred thousand German soldiers, with Frederick Barbarossa at their head. After a long siege the city surrendered. But soon it revolted again. The emperor besieged it once more and once more it surrendered. Its fortifications were destroyed and many of its buildings ruined. But even then the spirit of the Lombards was not broken. Milan and the other cities of Lombardy united in a league and defied the emperor. He called upon the German dukes to bring their men to his aid. All responded except Henry the Lion, duke of Saxony, Frederick's cousin, whom he had made duke of Bavaria also. Frederick is said to have knelt and implored Henry to do his duty, but in vain. In his campaign against the Lombards Frederick was unsuccessful. His army was completely defeated and he was compelled to grant freedom to the cities of Lombardy. Everybody blamed Henry the Lion. The other dukes charged him with treason and he was summoned to appear before a meeting of the nobles. He failed to come and the nobles thereupon declared him guilty and took from him everything that he had, except the lands he had inherited from his father. Frederick now devoted himself to making Germany a united nation. Two of his nobles had been quarrelling for a long time and as a punishment for their conduct each was condemned, with ten of his counts and barons, to carry dogs on his shoulders from one country to another. Frederick finally succeeded in keeping the nobles in the different provinces of Germany at peace with one another, and persuaded them to work together for the good of the whole empire. He had no more trouble with them and for many years his reign was peaceful and prosperous. 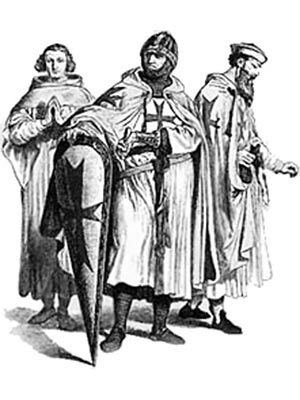 After the Christians had held Jerusalem for eighty-eight years, it was recaptured by the Moslems under the lead of the famous Saladin , in the year 1187. There was much excitement in Christendom, and the Pope proclaimed another Crusade. Frederick immediately raised an army of Crusaders in the German Empire and with one hundred and fifty thousand men started for Palestine. He marched into Asia Minor, attacked the Moslem forces, and defeated them in two great battles. But before the brave old warrior reached the Holy Land his career was suddenly brought to an end. One day his army was crossing a small bridge over a river in Asia Minor. At a moment when the bridge was crowded with troops Frederick rode up rapidly. He was impatient to join his son, who was leading the advance guard; and when he found that he could not cross immediately by the bridge, he plunged into the river to swim his horse across. Both horse and rider were swept away by the current. Barbarossa's heavy armor made him helpless and he was drowned. His body was recovered and buried at Antioch. Barbarossa was so much loved by his people that it was said, "Germany and Frederick Barbarossa are one in the hearts of the Germans." His death caused the greatest grief among the German Crusaders. They had now little heart to fight the infidels and most of them at once returned to Germany. In the Empire the dead hero was long mourned and for many years the peasants believed that Frederick was not really dead, but was asleep in a cave in the mountains of Germany, with his gallant knights around him. He was supposed to be sitting in his chair of state, with the crown upon his head, his eyes half-closed in slumber, his beard as white as snow and so long that it reached the ground. "When the ravens cease to fly round the mountain," said the legend, "Barbarossa shall awake and restore Germany to its ancient greatness." Some interesting facts and short biography information about the History, Life & Times of Frederick Barbarossa. Additional details, facts, history and information about the famous people of the Middle Ages and important events during their times can be accessed via the Middle Ages Sitemap.